Names are big deal in many cultures and religious traditions. Names are so important in Judaism that we even call God, “The Name.” (השם) In both of my spiritual communities I stand out as a bit of an oddity because I don’t have a “name.” I’m just Carly. Now you are probably reading this asking, “what about Chava Chai (חוה חי)?” Right, well — actually — write. I only use that name in writing. It’s me when I’m writing words on paper, but not when I’m standing next to you. Only once has that name been used for me aloud and I felt like it was mine. There was a time that even though no one called me by a special name, I had one for myself and would use it in ritual environments. Years ago I was asked in a ritual, “what is your name in this place?” The answer came quickly and easily, and it wasn’t Carly. This past week, I was at the second week of Kohenet intensive training. Someone pointed out that I have a problem with my name. I disagreed, but then it was pointed out that I didn’t even put it on my calling cards. 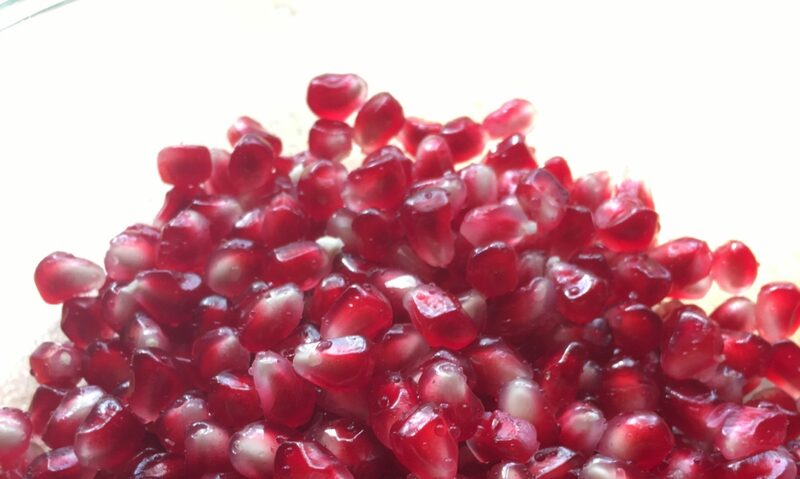 I had “Peeling a Pomegranate” and the URL — but not my name. Now when I made the cards, my focus was on the site — not me personally — but isn’t that odd? When I got home I started to talk it over with my husband and he pointed out that I’ve always had an issue with how little thought was put into naming me. My parents have always told me that my name was picked out of a book on the way to the hospital. I was supposed to be a boy — they picked the name at the last minute, “just in case.” My parents didn’t give me a Hebrew name either, my older sister was given one — but I guess they just didn’t bother with me. I picked my own Hebrew name when I started Hebrew school — Carmeit. I named myself after the most beautiful woman who was a cousin to an exchange student who lived with me when I was five or six years old. She died a couple of years later. She was the first person I cared about who died — so I chose her name. That name while holding nostalgia, lost meaning over the years. That’s why I took on Chava Chai (חוה חי) about four years ago, but no one actually calls me that. I think the problem is that I’m tired of naming myself. I actually want someone to care enough to name me this time. I think the name will come either at the first or second Kohenet initiation. I see my future self so intricately tied to being a Kohenet that the name will come as part of this experience. I do know one thing though — I won’t be naming myself again. Maybe I’ll grow into Chava Chai (חוה חי), maybe I’ll grow into something/one else. The name will come, but not from me. Whether it’s from human lips or Divine emanation that rings in my ears, I can live with either. I just can’t name myself again. I have my odd own take, but it's almost an opposite problem — I technically have two Hebrew names. My given name is Aron any my Hebrew name is Avrahum. Then there's the issue that I have one A in my name which technically would make my name be the equivlaent of the Aron Kodesh, the holy ark. Maybe it has to do with my own dual nature both feeling pulled to a certain sense of tradition as maintaining a path in the Rabbinic sense and another Pagan sense of tradition as the ancestors. Just thought my thought might help in my own issues with names. Your thoughts are always appreciated! I love Aron Kodesh. That dual nature is probably one of the reasons that I have such a problem with my name. The name that has resonated the most strongly for me, and I could most see being called again isn't Jewish. It's Veruna Wyn. I used to use that online. Veruna is a Lithuanian goddess of the moon and tides, and Wyn is the rune of joy. I feel really strongly connected to the mythology of Lithuania. I'm part Lithuanian and it's a common ancestry that I share with my goy-boy husband! We both connect really strongly with the native pre-Christian religion of Lithuania.